He's a one-of-a-kind filmmaker and artist, known and beloved for his quirks and style, and a genuinely interesting person to talk with. In theaters this weekend is the eighth film from Wes Anderson, known for an impressive oeuvre of work so far, from Rushmore to The Royal Tenenbaums to The Life Aquatic to The Darjeeling Limited to Fantastic Mr. Fox to Moonrise Kingdom. His latest is The Grand Budapest Hotel, which I was lucky enough to catch at the Berlin Film Festival world premiere (my review) a few weeks ago. I met up with Wes in New York recently to chat about the film, his career, Hollywood, and a few other things. It was an odd interview, to say the least, not exactly how I expected it to go, but fascinating none-the-less. I've been looking forward to talking with Wes Anderson for quite a while, as I've been a fan since before this site existed. My favorites are Fantastic Mr. Fox, Rushmore and The Life Aquatic, though I also very much enjoyed Moonrise Kingdom, Grand Budapest Hotel and even The Darjeeling Limited. I prepared what I thought was a solid set of questions for Mr. Anderson, however was presented with some odd "not really… no" answers to a few of them, but that may just be the way he answers. Everything else went fine and he seemed to like answering about his work even if it was an interesting topic to discuss. Two producers were also in the room, and at one point one of them chimes in - as seen below in this raw transcript of our chat. Congrats on Grand Budapest Hotel. I've seen it twice now… And I think I may end up going to go for a third time. Wes Anderson: Thank you, thank you. It's a great film, and I love your work. So I wanted to focus on what makes you, you and what defines your career so far. So with Grand Budapest Hotel, when you're shooting, are you at all thinking about an "entertainment factor" or is it purely a natural part of the story? Anderson: Somebody asked me something the other day, which was: this movie is a comedy but there is a very dark and serious context, let's say, for the movie. "How did you balance these things?" I said, well I don't know. I don't remember balancing anything, I don't remember doing that. But then I did have a thought. After a minute I went back to it, because I thought, "Well, maybe that's why there's all this blood in the movie…" I've never had a movie where body parts were being removed. There's a physical brutality in our story that I think has to do with the cloud over the story, where the world is going at that point, what it's referring to… Even though it's an invented history, we know what we're talking about. We all know what happens in Europe in our version of that period. But as I say, I had no answer at first because I had never thought about it. I have the same first answer to this: I have no idea. I don't really think about that. I do have some characters I want to write something about. I have something that I'm interested in. And whatever the thing is I'm interested in is kind of finding its way in there. But I'm definitely not trying to communicate a thematic idea or something like that. I'm just trying to create this experience. And I'm not really thinking about what should be serious, what should be comic, what is entertaining. I just want to make it interesting and see if it can be a strong dose of whatever it ends up being. And the other thing is I've always felt this was some kind of metaphor, but… Do you know how writers often say the characters take over… But that is more or less what it always feels like to me, too. Even though that's just a way of describing how your brain is working, it's still what you tend to feel. Now it feels right that they do this or that this happens, and everything else feels wrong. So… that's the end of my answer to that. At what point did in development the Lobby Boy and Gustave's relationship form? And when did it become specifically about that? Related to that - was there more with the side characters and the side stories that you focused on originally and cut out, or was it only ever the Lobby Boy/Gustave story we're focusing on all along? Anderson: I don't remember cutting out anything. I'm trying to think if there were some detours, but no. I think you got the whole deal. I will say one thing that's different in the movie from what I kind of thought we were doing was—it's faster. I mean, the '60s part of the story with Jude Law and Murray Abraham is kind of slower, quieter. And then when Ralph Fiennes part starts, it's very brisk. I hadn't particularly envisioned it that way or anticipated that. It's just sort of the way it happened. Specifically with Ralph's character M. Gustave, I think you had mentioned before that you had specifically written it for him. But he wasn't interested in it to begin with? I think it was from Berlin at the press conference where Ralph was answering questions about his character and he had read that part and was afraid to do it at first and didn't want to take that part at first. So my thought was: there's one part in this movie that's the best part, I think. Why don't I not offer it to Ralph and see what happens? But the only thing was, Ralph was finishing a movie he was directing [The Invisible Woman]. And if you are trying to get an actor, the absolute worst thing you can have, other than Martin Scorsese offer them a part at the same time, the absolute worst competition you can have to get an actor's attention is—they are directing their own movie. People tend to be pretty single-minded when they are in that head space. But it timed out very well. He fully finished his movie and came straight to us. Do you often write for specific actors nowadays, give or take for a young lead, it seems? For example, with Jared Gilman in Moonrise, and the same with the Lobby Boy in this one. It's someone we don't know, and that it's very important to have someone like that that fits, but there are so many other roles where I am glad we have actors known from your previous films continuing to show up. Anderson: Right. I definitely didn't know anybody who I thought would be good for the Lobby Boy part. In fact, as soon as there was a script I sent [the producers] the script and I asked you: "We have two things we want to do. One, can we start looking for where we want to make the movie, how we're going to do this? And two, can we…" Oh, no. Wait. I remember. There were two things that were my first question: Can we hire a casting director to start looking for this kid? And hiring a casting director in that situation is not hiring one person. It's hiring one person who is going to then hire 20 people, because we're going to be looking in North Africa, and Lebanon, and Israel, and France, in Anaheim, which is where we found that kid. And so, yes, casting director, and yes, you can hire a painter [for "Boy With Apple"], because my other worry is that you hire somebody to do a painting and they take three months, and then you see a version and then you say, "But we talked about this and this." Finally, they unveil the next one and now it's even worse and you start over. That's what can happen. What we didn't want to do was end up saying, "We're all ready to make the movie and we're going to have to digitally put the painting in later." So we got a casting director and a painter. We had found this painter… anyway, I overly answered your question. Well, for example, with Bill Murray, do you write a character with him in mind while writing it, or do you think, "I'm going to write a great character" and then later realize once you've finished that this will fit well for Bill Murray. Anderson: In the case of this movie, the only person that I was thinking about during the writing was Ralph. Everybody else in the movie, it came later. How often does that happen with your writing? I know we're talking about Grand Budapest, but in terms of anything you are working on in the future, and with Moonrise, too. Anderson: Moonrise Kingdom, I think… You know, I had actors who I had been wanting to work with. I did have this thought of Bill Murray and Frances McDormand being a married couple. I didn't have a lot in mind in that one. I don't know. Darjeeling Limited, we had those [three] guys in mind, I think, from pretty early on. But usually I feel like there is a script and we start trying to cast it. Gene Hackman, his part was written for him. And I told him. In fact, Royal Tenenbaums, most of those parts were written for people who I had approached and said, "I am making a script. I would like you to set aside this time and such and such a date." They all passed, essentially, including Gene. So the movie ends up being the people who did agree to do it and Gene, who was sort of forced. But also Bill Murray, and Owen Wilson, and Luke Wilson. Luke Wilson, it was written for Luke and Luke didn't pass. But other people did. Dare I ask with these guys [the producers] in the room, but how much control do you have on set nowadays? Do you like control or has it become something where everyone knows your vision so well you can just say "let's make it happen," and boom, there it is, let's shoot. Anderson: It's not really like control… I feel like that it's a good question, but it's also more like the question you wouldn't ask if you did our work. You wouldn't think about it. The control thing is sort of like there's a big group of collaborators and we have a bunch of stuff we gotta get done, and we're going to decide these things. We're going to prepare a lot of things. We've got a script. We're figuring out a game plan. We are gathering ideas. That's what it's about. And when it comes to the day and now all the stuff we've prepared is there, we get these actors together and we start working very, very quickly shooting this stuff. It's more about an energy. It seems that your sets are so specific in what we see on screen, that's why I'm curious. There's so much complexity to them and I'm wondering if that complexity has lessened over the years to create what you want to create in the end. Anderson: I don't feel it getting less complex. Do you mean what's going on camera being less complex? No, what you must do to achieve the look and, as a filmmaker, what you must put in to build the set and to put all the pieces together to actually come up with the end result of what you want to see onscreen. Anderson: I think it's a good question. And I think the answer is… because I think, in some ways, the stuff we're trying to do has gotten more… there's more moving parts. Some of the stuff is bigger—The Life Aquatic was this big, huge complicated thing. And this one is a little bit more on that scale than anything I've done since then in some way. But we made the movie for sort of a thirdish of the budget. And the way we do it is because we've got all these systems that we've sort of developed over the years of how we're going to get these things done in a context and for a budget that we like. I mean it's not just us saying here's the most money that we can raise to do this. It's here's the amount of money we want to spend on this movie because we don't want to make a $60 million movie that grosses… We don't want to be in a situation where the expectation is that the movie has to make more money than we think it's really ever going to make, because then there's a certain pressure that you have to change the movie. A distributor is going to say, "We can't, in good conscience, etc, etc." Did we answer that question for you? Jeremy Dawson: The system has gotten more and more fine-tuned. It's all geared toward the way that your vision is going to get best on the screen. It's super-efficient. We don't waste… it's not wasteful. We don't have extra stuff that we shot that we don't use. We don't have extra sets. The set might end right where the camera ends. So it's all waste management. It's fine-tuned to clean up and apply to somebody else's movie. I guess that's why I was curious. That's what it seems like, but you still produce something that is a one-of-a-kind creation on the screen that I admire. So years ago we stopped doing any of that. Nobody comes in at all. Nobody is allowed anywhere near anybody during this stuff. And some actors… Like, Ralph is somebody who is super conscientious about… and also, his character, he has the whole… the thing. So Ralph has his mirror. He checks his wig. [motions] He does his thing. His tie has to be exactly like this. He's doing the thing. [hand motions] And if he wants help, he calls for the person. But there's not this flood of activity. That helps us enormously because we like to do a lot of takes. But if you let people come in, it doesn't just slow you down. It at least quadruples how long it takes to do the takes. Thanks for answering. The last thing, and don't take this the wrong way, but how have you stayed away from Hollywood? How have you not become sucked up into that machine? I could see it easily happening to you, that they could say, "we'll give you this amount of money to make this Hollywood movie and then put the little Wes Anderson spin on it." But how do you stay away from that? I also think of—did you see the SNL horror sketch? That thing where they almost start wanting your style. How has that not happened? How do you stay out of there? Well, I want to see it because it's fun. I would love to see your horror movie. Anderson: No. It's not. We haven't been seeing these… Nobody has been banging down the doors for a franchise. Over the years, every now and then something comes up and they say, "What about this thing?" The main thing is simple. As long as I have a thing I actually want to do, my own thing, then good, let's do that. And I don't have to worry about whether or not there might be something that I could do with this other thing. So, yea. That's what makes it not a challenge. The combination of no offers and I know what I want to do anyway, simplifies it. That makes sense. I hope you remain this way, because I do enjoy your original work. Anderson: Thank you very much. That's why I was asking from the context of, I hope you don't get sucked into Hollywood. Thank you to Wes Anderson for his time, and to Fox Searchlight for arranging this interview. 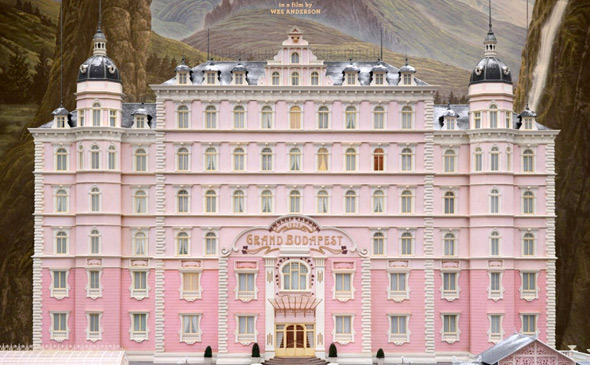 Wes Anderson's The Grand Budapest Hotel arrives in limited theaters starting March 7th, 2014, with openings around the world during March/April. Read my review from Berlin and catch the film in theaters. Thanks AB! Anderson is in the prime time of his career. After watching Grand Budapest I could see him do a Horror movie, even a serious one. I imagined he likes Polanski, I mean every sensible person does 🙂 Great interview!